Xiaomi seems to be gearing up for its next launch — Xiaomi Redmi 3A. The device is listed on TENAA website, hinting that the device received its approval from TENAA, the Chinese telecom equipment certification authority. 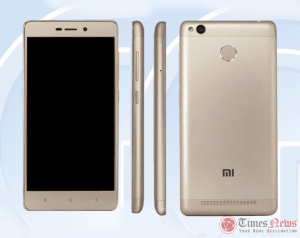 Carrying the model number Xiaomi 2016030, Redmi 3A comes with a 5-inch HD TFT display with 1,280×720 pixel resolution. Under the hood, the smartphone houses a 1.4GHz octa-core processor (likely to be Qualcomm Snapdragon 415 SoC), a 16GB internal storage expandable up to 128GB via microSD card, a 2GB RAM, an Android 6.0.1 Marshmallow out of the box, a 13MP main camera, a 5MP front-snapper, and a 4,000mAh battery. It measures 139.3 × 69.6 × 8.5 mm and weights 143 grams. In terms of connectivity, it supports 4G LTE, 3G, GPS, Bluetooth and WiFi. The device is expected to come in two colors — silver and gold. PLEASE HELP!! My Mi4i is consuming apporx. 24 MB of data (in 4 steps 6+6+6+6) by Google Service Framework whenever I am restarting my mobile. One of xiaomi’s major drawback is that the miui does not allow transfer of apps to SD card. Redimi 2 prime still runs on KitKat. And yes, service centres are ill equipped, and very few.